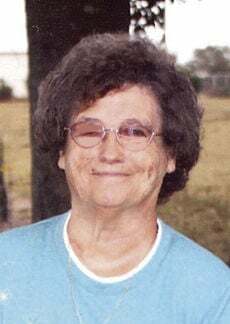 Jeanette Boswell age 75 of Elba, AL died Monday, April 15, 2019 at her home. Funeral services will be held from Hayes Funeral Home Chapel on Wednesday, April 17, 2019 at 11:00 AM with Rev. Donald Hall, Rev. Bryan Sawyer and Rev. Wayne Sharpe officiating. Burial services will follow in the Fairview Baptist Church Cemetery. 10:00 AM to 11:00 AM. Survivors include: husband - Charles J. Boswell; son – Keith (Dana) Boswell, daughter - Cindy (Eric) Gibson, brother - Preston (June) Kelley, Jr., all of Elba; sister - Maggie Marsh, Sellersville, AL; granddaughters - NiCole (Josh) Reeves, Dothan, AL, plus - McKinley Gibson, and McKinley Gibson, both of Elba; grandsons – Hunter Boswell, Enterprise, AL, and Wade Gibson; great granddaughter - Annistyn Reeves, Dothan. She was preceded in death by her brother - Qunion Kelley and sister – Betty Jean Preston.